Not only that, you could then use that stored user data in future surveys or invitation. For instance, you could merge the user’s contact information into a subsequent survey and ask if they needed to update their info or merge their first name into an email invitation to make it more personal. In the example below, we’re going to look at the steps needed to collect user contact information for use in future surveys. NOTE: User Profile Properties and the Profile Property Updater will only apply to respondents who are registered users in Checkbox and who are logged in while taking your survey. They can log in manually or be auto-logged in through Checkbox invitations. However, you cannot access Profile Properties or use the Profile Property Updater on anonymous surveys or surveys that are sent to email addresses (versus users). 1. 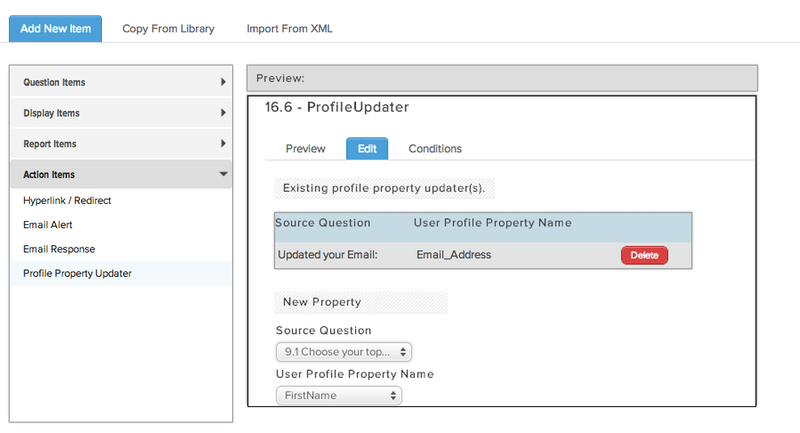 Set up your Profile Properties – In order to use the Profile Property Updater, you need to first make sure that all the Profile Properties (aka user profiles or user attributes) that you need are set up. A System Administrator can do this under Settings -> User Settings. 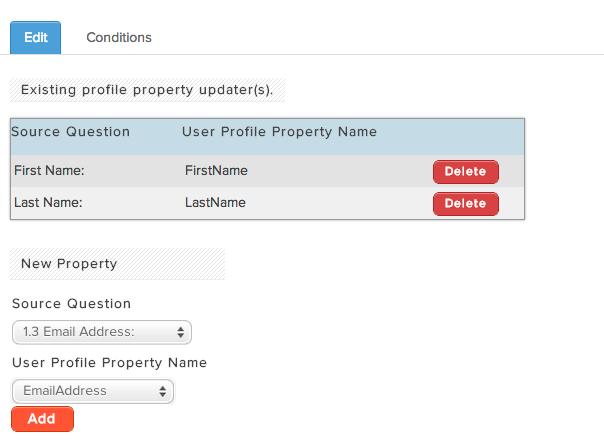 For more information on setting up custom Profile Properties, please see our User Profile Guide. 2. Create SurveyQuestions to Collect Your Data –Now you’ll want to collect the info that will populate your user’s Profile Properties. In this example, we created a simple survey with open-ended single line text items to collect the values for First Name, Last Name, and Phone Number. 4. Use Your Data – Once our Profile Property Updater is set up, every time a registered Checkbox user takes our survey, the contact info that we collect will automatically be sent to their User Profile and can be used at any time. For instance, when we send a follow-up survey, we can merge those values into our questions and ask the user to confirm or update their info. For more information on merging, please see our Merging Guide.